In case you missed it last night, a new streaming service called Tidal washed up on the internet. Well, re-washed-up, to stretch the pun a little - because it originally launched six months ago. The difference this time is that Jay Z now owns it - he shelled out $56 million for the company back in January. Tidal's key differentiator is that it offers high-definition lossless audio quality, as well as a few extras like editorial and music videos. According to some, that makes it a "Spotify killer", or "big trouble for Spotify". But Spotify CEO Daniel Ek doesn't seem too worried. He spent last night mocking the turn-everything-blue press campaign that Jay Z cooked up. Why not? Well, Tidal almost certainly isn't the revolution it's claimed to be. Let's start with the price. £20 (US$20) a month if you want high-definition music, or £10 (US$9.99) otherwise, with no free tier. That's expensive, especially in a market where Spotify is already criticised for charging too much. The vast majority of people can't tell the difference between Tidal's lossless audio and the high-quality Ogg vorbis files used by Spotify, and even fewer can tell the difference on headphones that cost less than £300. If you want to know if you can tell the difference, Tidal has a test on its website where you listen to five tracks and guess if they're lossless or not. But five tracks is hardly enough for a statistically-valid comparison, and besides, you're a fool if you trust a test run by a company that sells lossless audio. So here's an independent, and far more statistically rigorous, alternative. Did you get a good score? It doesn't matter. Because whether or not you can hear the difference isn't really the point of Tidal. Allow me to explain. No-one buys a ridiculous expensive wristwatch because it's better at telling the time than a £30 Swatch, do they? No, Tidal's selling perceived status - you can be that kid on the school bus who has the high-definition music that everyone wants to listen to. Or the owner of the nice car that all your neighbours glance at enviously. Or the farmer who has the jar of snake oil that cures all ills. 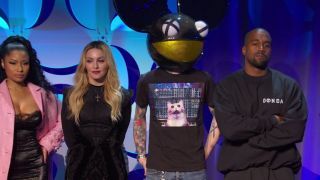 But selling snake oil effectively requires endorsements from people who sound like they know what they're talking about, which is why Jay Z dragged all his pals on stage last night to talk about how much they loved Tidal. Alicia Keys, Win Butler and Regine Chassagne from Arcade Fire, Beyoncé, Calvin Harris, Chris Martin, Daft Punk, Deadmau5, Jack White, Jason Aldean, J Cole, Kanye West, Madonna, Nicki Minaj, Rihanna and Usher were all rolled out to be anointed as "owners" of Tidal, meaning they get equity in the company. The whole thing was remarkable, because even a snake oil salesman wouldn't be foolish enough to tell the public that the experts vouching for his product were getting a share of the profits. 3%, and a $3 million dollar cash sweetener, if the FT's sources are accurate. Jay Z didn't even speak at the somewhat-awkward event himself - he let Alicia Keys give a weird speech, quoting Nietzsche and trying to paint the whole endeavour as a revolution in music - redirecting money from big corporations to artists. She also called it "the first ever artist-owned global music and entertainment platform," which is clear evidence of one of the most heinous crimes in music: forgetting about Dre. All jokes aside, this isn't taking from the rich and giving to the poor. It's taking from the rich and giving to Jay Z's mates, who happen to also be quite rich. Any musicians that aren't in Jezza's WhatsApp buddy list won't benefit much from Tidal, even if he pledges to raise the royalty rate, as he did in a Billboard interview shortly after the event finished. "Will artists make more money? Even if it means less profit for our bottom line, absolutely. That's easy for us. We can do that. Less profit for our bottom line, more money for the artist; fantastic. Let's do that today," he said. Except that Spotify's margins are already razor-thin - the company pays out 70% of its revenue to rights holders, before paying for staff, server, development and marketing. Despite earning a billion dollars in 2013, it's still not profitable. So where will the extra cash that Tidal wants to funnel to artists come from? If your answer is "customers paying more for high-definition audio", you're dramatically overestimating the number of people who are going to splash out for the upgrade. And what happens if Spotify or Apple (or YouTube!) suddenly launches a high-definition music streaming service in a month's time? Tidal is basically sunk. So what else could save Jay Z's music service from being washed away? Music Ally suggests exclusives - which is not a bad idea, given the number of high-profile artists who are signed up. Taylor Swift, who pulled her catalogue from Spotify amidst a bitter argument about the freemium tier, is notably present on Tidal. But exclusives are bad for consumers - they lead to walled gardens, and that's not a good thing for an industry that's still very much attempting to establish itself. You only need to look at the slow growth of streaming TV and movies, compared to music, as evidence. In short, the way it looks today, Tidal is a terrible proposition. It's selling snake oil, sharing the profits with the richest artists alone, and the only way it's going to be able to get market share is by screwing over consumers by withholding catalogues from other services. Competition is generally a good thing; there are a whole lot of ways that streaming music could be better for artists and customers in 2015, but Tidal represents none of them. Spend your cash on going to gigs instead.